Hi folks…I am still working out the formatting on this blog…but wanted to get the content started here. For the first post on this blog I am going to copy over something I wrote last year on my original Sundry Collectibles blog. Have no fear though…I have plenty of original material that I will be presenting in the weeks to come! 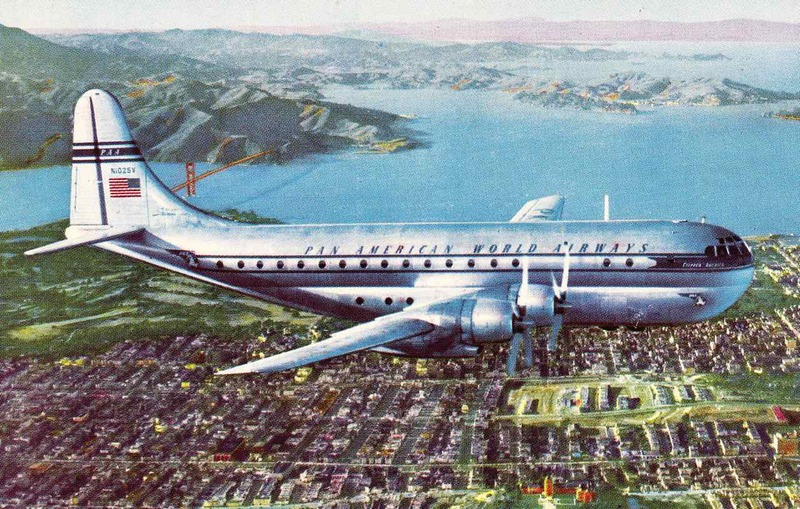 I recently picked up this card of a Pan American World Airways Clipper flying above the San Francisco Bay. It is not, perhaps, one of the most attractive aircraft ever built, but a little research has revealed that this was a rather capable aircraft in its day. The Boeing 377 was based on the C-97 military freighter, which had it’s heritage from the B-29 Superfortress. It was a double deck aircraft and could seat up to 100 people depending on the layout (some had sleeper berths in them with a lounge on the lower deck). It was actively used from 1947 through 1963 when the jet age basically replaced planes like this one. With the help of a magnifying glass, I was able to determine that this card is of N1025V, an aircraft that started life named as the Clipper Celestial, was later changed to Clipper Rainbow, and finally Clipper America. 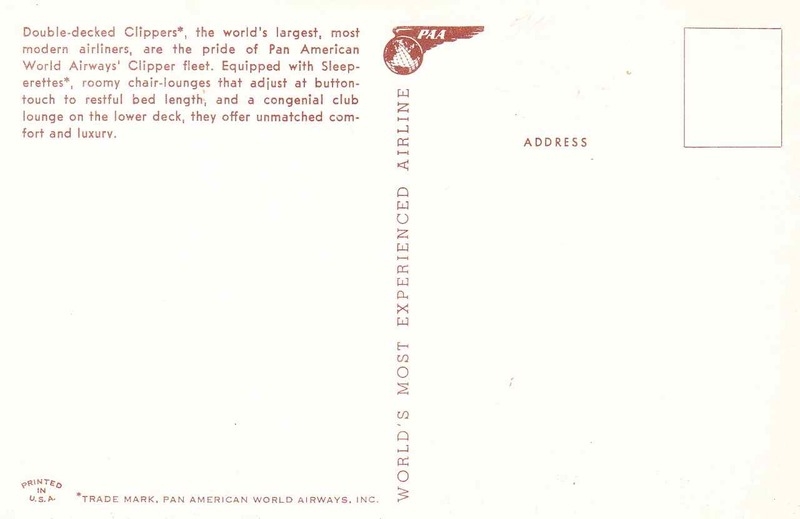 For more details, check out this video on the Pan Am operated Boeing 377. The third part of this video is especially interesting. It gives a contemporary perspective on the then giant aircraft and the amenities it offered. 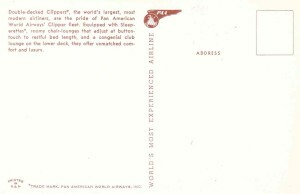 This entry was posted in Boeing, Pan American, Postcard and tagged Boeing, Boeing 377, Pan American Clipper. Bookmark the permalink. 2 Responses to Welcome to Vintage Aviation Paper! Do you have any vintage postcards of Scandinavian Airlines System’s postcards? I don’t think I do actually. I mostly focus on US airline. But I will take a look and get back to you. Glad you found the site!